I have decided to post some of the information on the Dardanelles mine in hopes that descendants of the people who were involved or perhaps mining historians may have an interest. The information about the Wrangell Garnet Ledge has proven to be very effective in sharing information as well as allowing descendants to find me. 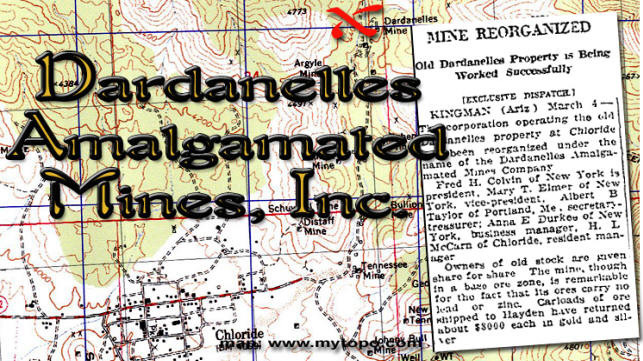 If you have information about the Dardanelles mine, I would appreciate hearing from you. I am planning on a trip to the mine September 2005. Please contact me if you have information to share, photographs, etc. Thanks! I have to thank the Arizona Geological Survey for helping me with a lot of the news clippings. Another gentleman from the NORCal list found the first news clippings for me that confirmed that Anna had been in Arizona. With AZGS in Arizona, I hit pay dirt! Whoever painstakingly clipped the news stories has my undying gratitude! I then found more articles online and have been able to put together a pretty good time line, to date. These are some of the ones that Anna filed claims to in Arizona: Ludlow Fraction Mining Claim, Dawn Girl Mining Claim, Dawn Girl No. 2, Dawn Girl No. 3, Wild Cat Mining Claim, Wild Cat No. 2, Thumb Butte, Mitchell Extension Mining Claim, Comstock Mining Claim, Comstock No. 2 Mining Claim, Comstock No. 3 Mining Claim, Parrallell Mining Claim, Memphis Lode Mining Claim. All but the Memphis Lode were located in the San Francisco Mining District. The Memphis Lode was located in the Chloride Mining District. Anna E. Durkee was not only busy with the Alaska Garnet Mining & Manufacturing Co.’s mine in Alaska, but she was working on the Dardanelles Mining, Co. which she incorporated in 1916. No doubt having hired good employees to operate the garnet mine allowed her to pursue other ventures including checking out the mining possibilities in Arizona. I believe that Anna may have tried her luck in Idaho about 1910-1911, but nothing has been found about her there. It could be that she was interested in the garnet mining in Western Idaho. Anna’s mining claims in Arizona is where she found her biggest success and the recognition of being a successful mining woman. Recently someone asked me if she actually worked in the mines as the men were very superstitious about women in the mines. After finding her death certificate, I’m beginning to think that she was more of a mining promoter than a mining woman. It appears that this is really what Anna was great at doing: putting the deal together and raising the money to get the job done. The interesting thing in looking at Anna’s mining activities was that she seemed to be doing a great deal of traveling between Arizona and Alaska in the interests of the garnet ledge. Probably the last of the travel to Wrangell was about the mid-1920s. The company had leased the site to two British Columbia companies for a brief time between 1921 and 1923. By that time, Anna had incorporated the Dardanelles Mining Company and was in the process of reorganizing the company into the Dardanelles Amalgamated Mines, Inc. She was spending time between Arizona and New York and reportedly living in California. A time line has been generated from news clippings about the activity of the Dardanelles and shortly prior to the Dardanelles being formed. Anna also had the Memphis Group which became part of the Dardanelles Mine. I haven’t found much information about that particular claim. In addition, it was noted that she was interested in the Tungsten Girl Mine, but have no information whether she actually purchased it or not. If you have information about any of these mines or of the area, please contact me.